The news of Nelson Mandela’s death Thursday at age 95 swept perhaps most swiftly through Twitter, where the sports world was, like the rest of planet Earth, mourning the loss of one of the most inspiring and influential figures of our time. Muhammad Ali on Mandela: "He taught us forgiveness on a grand scale. His was a spirit born free, destined to soar above the rainbows." 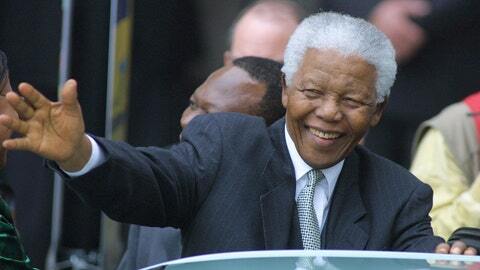 Condolences to all on the passing of our beloved Father of the South African Nation, Nelson Mandela. Madiba we loved you. Rest in Peace. R.I.P to one of our WARRIORS!! The Great Nelson Mandela. Thank you madiba. You will never be forgotten. Rest in Peace Nelson Mandela. We will never forget the role you played in our country, in our sport, and for that we are eternally grateful. Both teams will be observing a minute's silence & wearing black armbands in memory of Nelson Mandela. I was so blessed to travel to South Africa,and witness firsthand the spirit of change that Mandela bestowed on the world. Great people make the world better for all of man kind not just one country, race or group. Mandela did it as well as anyone. RIP! Nelson Mandela was a great man. A bright light has gone out. His ability to lead & inspire are unparalleled in my lifetime.